Umbrellas come in handy during inclement weather, but their flimsy design can often cause them to fall apart. Some have found durable designs and upcycled uses for them that are creative, but are also weather ready and waterproof. Crafty Moods has a clever idea for less than perfect umbrellas. This do it yourself canopy costs much less than a purchased one and can be personalized. 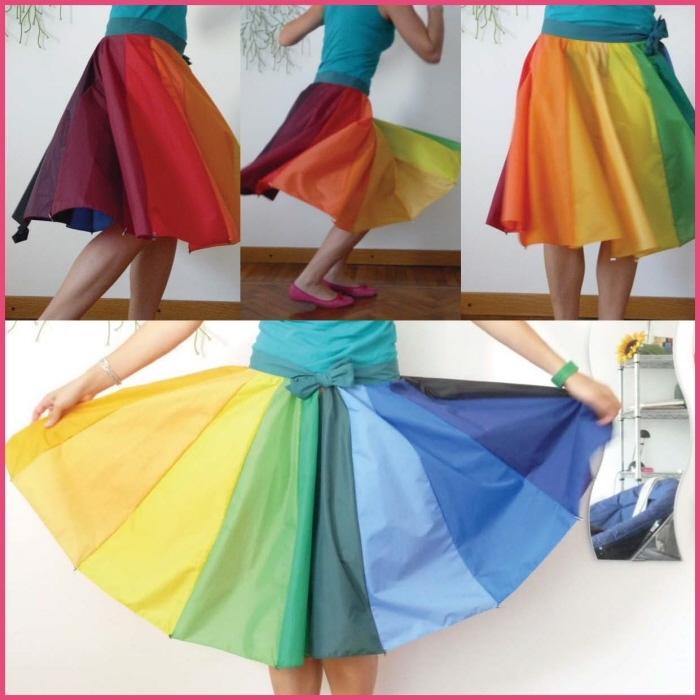 Just affix a sheet, curtain or favored fabric around it by sewing to the end of the umbrella. Or, for a no sew project use a grommet punch and run ribbon or string through the material and tie it to the spoke ends of the umbrella. Resalvaged designs that are perfect for playdates and don’t have to be reserved for rainy days are play parachutes and decorative banners. Another practical reuse for worn umbrellas is turning them into bags. An easy to follow tutorial from Everyday Crafty Goodness shows how to create your own grocery bag that will be stain resistant and easily cleaned up. Designers like Catherine Charlot have created sustainable fashions and accessories crafted from old umbrellas. Her design company, Himane, has reprocessed the rainy day staple into materials used in dresses, totes and clutches. Cecilia Felli is another designer whose utilitarian outlook has made some head spinning skirts. Her industrial designs are colorful, unique and true to their umbrella form yet still entertainingly wearable. A bonus – no ironing required. Umbrella fabrics are sturdy and can be used for tons of upcycled projects, but if the fabric is unrecoverable there are still many uses for the internal mechanisms, like this one from T.O.M.T. This umbrella chandelier isn’t fit for a storm, though. If you like to do patchwork design, threads provides instructions and a pattern on how to recover an umbrella. Still don’t know what to do with broken, old umbrellas? Donate them to designer for the dogs Taryn Zychal of RecyclingZychal, who turns them into dog rain coats.